I made this train birthday cake for my nephew’s 5th birthday. 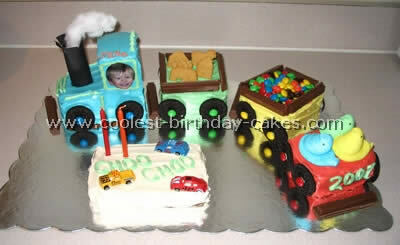 I baked my cakes in loaf pans and cut off one of the cakes, placed it on top of the other to make a locomotive. I decorated my cake with fresh whipped cream and used fruits on the wagon trains. It was a hit and he loves it. I used mini loaf pans to bake this train birthday cake. I colored fondant to cover the cakes. I decorated with gumdrops, suckers, M&M’s and Oreos for the wheels. The smokestack is made from a toothpick covered in fondant. Using two box cake mixes I put the batter into mini loaf pans as well as a Pyrex set that had containers just perfect for the engine and caboose. I used butter cream frosting I bought at the local grocer’s bakery so the colors where nice and bright. I had to cut off a bit of the rounded part of each cake and trim some to make it look neat. I used a flower tip on my decorator and then added little embellishments like Oreo wheels (with M&Ms), Dots pretzels (for logs), crushed Oreo (for coal), licorice (for the tracks), crushed graham cracker (in between tracks) and a marshmallow and caramel puffs for the smoke stack. The licorice track stayed put nicely after I lined it with red frosting. 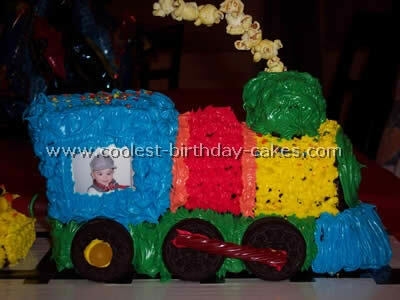 The train birthday cake as a big hit for my little one’s first birthday although his favorite part was the marshmallow! 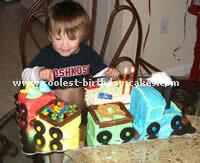 This is a train birthday cake I created for my son Owen for his second birthday. I baked six mini loaf cakes and one 9” round cake. 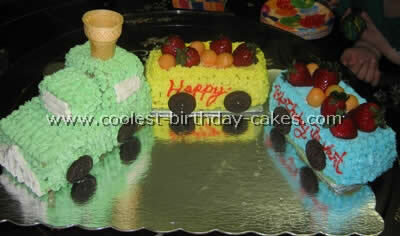 I decorated five of the mini loaves for trains using the sixth cake as "pieces" to add interest to the train cars (e.g. the engine). The round cake is the hill – I cut it in half, frosted the middle, stuck the pieces together and frosted it green. The tracks are black licorice and chocolate covered wafer cookies. I stacked the wafer cookies (1 then 2 then 3) as they approached the hill so the trains could ramp up. The wheels are mini-Oreos. The smokestack is a large frosted marshmallow with smaller marshmallows strung on a piece of wire creating the smoke. The whole train birthday cake took about two hours to decorate but was well worth it. I received many compliments and Owen absolutely loved it! I made this train birthday cake for my son’s 2nd birthday. I got the idea from looking at this website along with some other ideas I had seen. The cake is three Sara Lee frozen pound cakes, cut to shape and the icing is store bought that I colored. My favorite part is the smoke stack…I made it from a black piece of construction paper rolled and taped. I cut the top a little and used two pulled cotton balls which I taped inside the rolled paper to look like smoke. The wheels are Oreos with M&M’s…and the tracks and railings of the cars are Kit Kats. My son loved the cake. 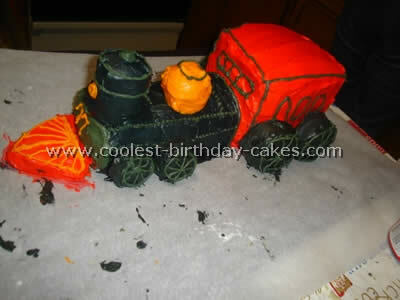 I took my ideas for this train birthday cake from others on this site. (Thank you to all who helped). The engine is made from mini loafs and a cake baked in a can from tomato paste. Each car is a mini loaf. I iced each car, placed mini Oreo’s for the wheels and found a variety of candy for the gold diamonds coal wood silver etc. The best ever hint I received…make the moist yummy cake mixes. Freeze the cake solid. Take the cake out (in this case a piece at a time) Make your cuts and ice quickly…especially the places where you have made the cuts. If the cake is still frozen then it will not crumb as you ice it. For icing I used store bought canned (such as Betty Crocker or Duncan Hines) the grass is colored coconut, the road is graham crumbs, the car and crossing signs are plastic from the toy box. When you have finished you can place it back in the freezer wrapped. Take out the train birthday cake about 2 hours in advanced at room temperature and it won’t melt or sag before you eat it. I used the Betty Crocker bake and fill pan and another round cake for the bottom. There is no special filling although I did use icing between each layer of cake. I made this train birthday cake for my 2 year old’s birthday. I also made a Thomas Character cake and his eyes lit up more at the site of this cake because it had an actual train on it. The train is old. I ordered it off of ebay. It is supposed to hold candles but I couldn’t find candles to fit in the tiny holes. 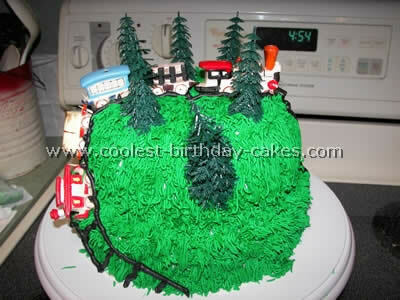 I was thinking of the Little Engine That Could while I made this cake. The whole train birthday cake was edible. I used boxed cake mix and made butter cream frosting. I first made the track with icing tinted black and Kit Kat bars. I used mini loaf pans and a tomato paste can (the littler ones) to bake the 3D train parts and also baked a sheet cake to serve to the guests. 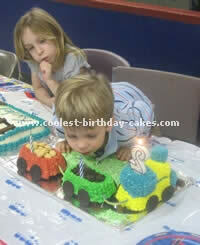 I baked 4 loaf cakes for the engine and two cars. 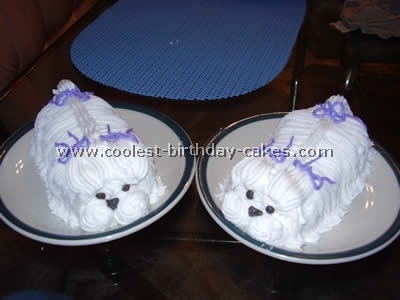 I cut one in half and placed it on the back of another with the tube cake from the paste can. I cut the other half into a triangle for the front. I piped it with a #21 tip stars all over. The smokestack is a marshmallow piped with stars. Each car is just a loaf cake piped with stars. I crushed Oreos for the coal and used whole Oreos for the wheels. I used Maple Nut Goodies candies for the boulders. I tinted come coconut for the grass and used sour straws candy to connect the cars. It’s not pictured because it got eaten before anyone could take a picture but I used cotton candy for the steam out of the marshmallow. I just iced a sheet cake and made the track continue for all the party guests. 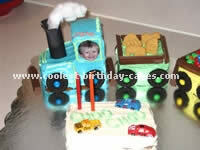 It was such fun to make a train birthday cake. This was a birthday gift for our neighbor who is a steam engine buff. We printed out some pictures from the internet of a train birthday cake and tried to be as accurate as possible. This was for an adult. We basically used mini loaf pans and 3 different sizes of cupcakes. We had to put a straw into the front stack so it wouldn’t fall. We used decorators icing for glue but for the main colors I bought ready made frosting and dyed it to color. It is very difficult to make black frosting! Normally it turns dark grey at most but my husband used Wilton coloring only and mixed black green yellow and brown. It actually came out black! The red was a bit difficult also normally coming out dark pink. With some work and mixing red yellow and orange my husband was able to come up with a true red. The color really popped! To our satisfaction our neighbor was delighted with his train birthday cake and gave us a history lesson on what type of train it was and the style. 440 American Steam Engine. 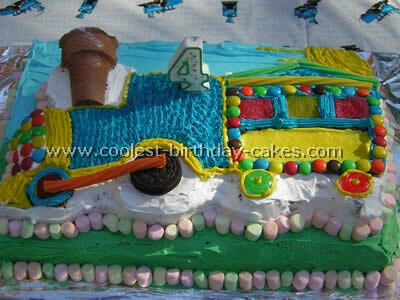 I made this train birthday cake for my son’s 4th birthday. We had a train theme. I bought a Wilton cake pan. I used two boxes of Funafuti cake mix and 3 cans of whipped white frosting. As you can see in the picture I used candy. I used Wilton food coloring and used an oreo for the train, wheel licorice for the traction rod, mini colored marshmallows to trim the border, lifesavers for the smaller wheels ,M&M’s to trim the train and in the front. I used an ice cream cone it for the funnel and a big marshmallow coming out of it to imitate steam. I rolled out gumdrops and cut them into little squares. I used piping for the rest of the trim. Took a while but people where stunned. It was my first time. For my son’s 1st Birthday I made a train birthday cake. 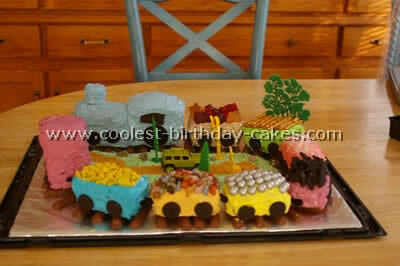 I used the Wilton choo choo train cake mold and mini loaf pans for the cars. 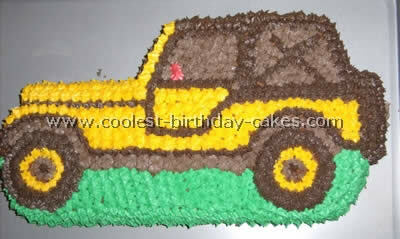 I decorated each car a different color and scooped out about 2 inches of the center so I could fill it with treats. The wheels were mini Oreos and the cars are attached with gumdrops. The Engine wheels are regular Oreos with twizzlers attaching them. I also took my son’s picture with him in his train conductor outfit and covered both sides with clear packing tape to look as if he was driving the train. As a final touch I strung popcorn on beading wire and stuck it into the top to look like smoke. I used two cake boards and cut strips of black construction paper to look like rails. I covered them with saran wrap and taped it to the under side. It was actually fun to do though it took about 3 hours. 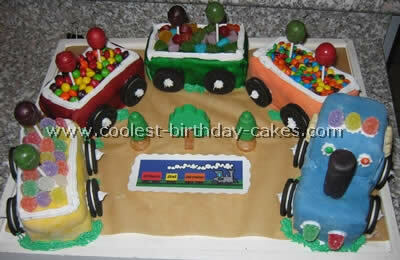 I prepared this train birthday cake from two cake mixes, my son’s favorite ones,rainbow bit and chocolate. I rented the engine pan from my local cake store and made the cars out of loaf pans. The wheels are oreo’s and I used smarties for the cargo. The icing was the difficult part I put each piece on an individual piece of wax paper which made it easier to work with. 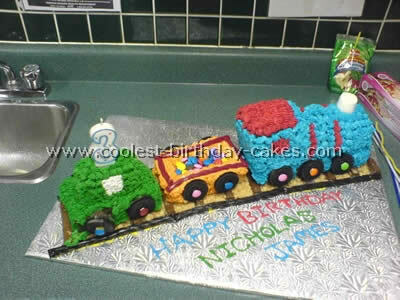 I used a cake mate green tube for the caboose and found the icing held up best. The engine and car were iced in cake icing from the grocery store that I scooped into Ziploc’s and added food coloring to. Just snip a corner of the bag and voila instant icing bag. I found the cake icing didn’t hold up so well out of the fridge and during transportation. The tracks were Kit Kat bars & black licorice and the dirt was crushed teddy grams. 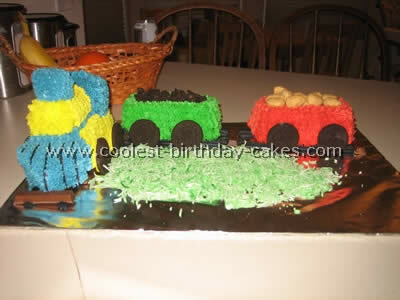 The train birthday cake was a hit and my son freaked right out! I would recommend giving it a try.